A warning about the weekend: there’s too much fun to waste it on sleep. Just put on your high heel sneakers and go go. Here’s your chance but grab it quick, Go Go’ers. 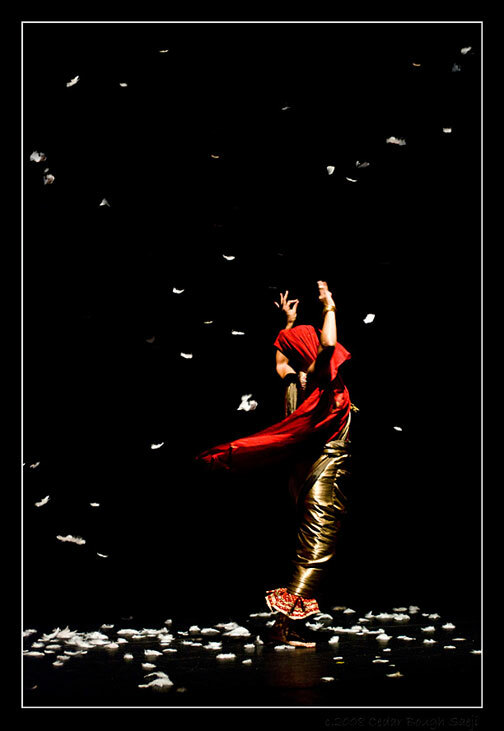 Thursday night, Sheetal Gandhi, creator/performer for Cirque du Soleil’s Dralion and a leading artist in Andrew Lloyd Weber’s Bombay Dreams, performs her gorgeous, stirring, and intimate solo show Bahu-Beti-Biwi presented Théâtre Raymond Kabbaz. It’s ONE NIGHT ONLY. Don’t delay getting those tix. The score for the multi-discipline performance of dance, theater, and live singing was written by Joseph Trapanese. Past collaborators include Daft Punk. You may know them. And after Bahu-Beti-Biwi, you’ll be very glad you know Sheetal Gandhi. SHEETAL GANDHI IN BAHU-BETI-BIWI — Thurs, Feb 6 @ 7:30; $15 – $25 — Théâtre Raymond Kabbaz, 10361 W. Pico Blvd., Los Angeles CA 90064 (310-286-0553). Buy tix HERE. Not too curious a sofa, we hope…. Absinthe cocktails and Edward Gorey-inspired antics are enough to make the 14th Annual Edwardian Ball the party of the year. Add in theatricals — this year, a stage adaptation of Gorey’s The Curious Sofa — as well as aerials, acrobats, cirque, dancing, dinner, music, stilt walkers and more corsets than you can shake a cigarette holder at and you have one hell of a fete. Edwardian Ball creators and co-hosts Rosin Coven and Vau De Vire Society have once again secured the gorgeous Fonda Theater, which ramps up the deco-meets-steampunk ambiance to “eleven” and this year, you’ll be able to sup while you sip. You always want to keep your…strength up while wearing a corset. 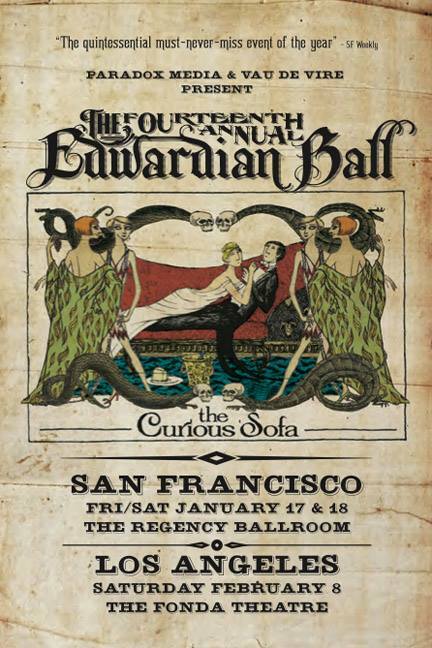 ROSIN COVEN & VAU DE VIRE SOCIETY PRESENT THE 14TH ANNUAL EDWARDIAN BALL — Sat, Feb 8, 8pm – 2am. $45-$75 — The Fonda Theater, 6126 Hollywood Blvd, Hollywood Get tix HERE. An online mausoleum for memories. It’s a brilliant, shivery, stunning idea. A late, beloved someone has left you something — or maybe many things: tangible mementos in addition to memories…meaning beyond monetary worth. How to honor the person and value the legacies? The musician/performer’s new transmedia show In These Boxes at the stately Center for the Arts, Eagle Rock, uses live music, narratives and video art of bequeathed possessions to celebrate the dead through their detritus. Don’t think of this as kitsch; it’s more like church. Saunders also offers, as he puts it: “An online cemetery for things the dead left us.” You can add items to a virtual memory wall by taking a photo and posting it to Instagram with the hashtag #InTheseBoxes. Or, send the photo, with or without story, to Saunders (http://dudleysaunders.com/contact/) who will incorporate the pieces into the show, which will be performed around the country in the upcoming year. And unlike a gravesite, you can visit whenever you want. IN THESE BOXES — Sat, Feb 8 @ 8pm; $8-$10 — Center for the Arts, Eagle Rock, 2225 Eagle Rock Blvd, LA 90041. Get tix HERE. Next Post The Valentine Weekend Go Go: Fake Prom, Dating Game Dance Party, Art & Poetry + More!